Seasons greetings from all of us here in Barbados, as the holiday season nears, be sure to get a head start on your Christmas and new year travel plans and make the most of our exclusive offers to be had. Make the most of your time off and make this Christmas break one to remember. 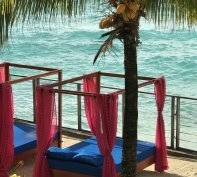 Boasting warm weather, lovely beaches, fine dining and an array of nightlife and activities, Barbados is the ideal place to spend a tropical Christmas. 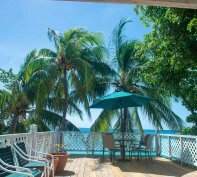 Sunset Beach Condo is a lovely two-bedroom two bathroom unit on the second floor at St Lawrence Beach Condos in the heart of St Lawrence Gap on the lovely south coast of Barbados. 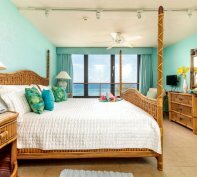 Fully loaded, the master bedroom has a King bed, en-suite bathroom and is ocean facing. From the bedroom you can step out onto the patio overlooking the sea. The second bedroom has two twin beds and there is a further shower bathroom. The accommodation sleeps four people. Dining is al-fresco on the patio which also has comfy sofas to enjoy your pre-dinner cocktail and capture those sunsets. The living room has lovely walnut brown rattan furniture and is tastefully decorated. 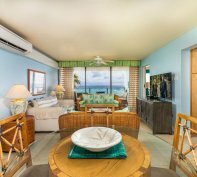 It also boasts a 50″ flat screen TV with a full TV package, BOSE IPod dock and each room of the apartment has its own air-conditioning and ceiling fans. We have free wi-fi and washer/dryer. There is a communal gas BBQ grill available for use around the pool area. 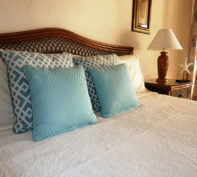 Towels (including beach towels) and linens are provided. Introducing Serendipity, a beautiful property located on the breathtaking East Coast of Barbados, Serendipity is nestled on 10 acres of land with a spectacular view overlooking the Atlantic Ocean. 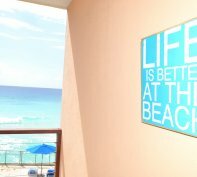 Serendipity is located between Martins Bay, St John and Bathsheba. Martins Bay is famous for its fresh fish and Bathsheba is the home of International surfing competitions, iconic rum shops and good island food. With views of Bathsheba, North Point, East Point and Hackleton’s Cliff, cool breezes, picturesque sun rises and sunsets are a few natural benefits to this property. The property is a two story house with two bed-rooms on the upper level, styled and designed to give a natural and authentic experience. With varnished floors, colourful artwork, unique island furniture and fittings. You can awe at the views whilst sitting on a sun lounger on the full wrapped-around balcony. season. Barracuda, Tuna, Wahoo, Dolphin (Dorado), and Blue and White Marlin! Fishing is particularly good between January and April when all of the game fish are in season. Experience the best deep sea fishing tours in Barbados with Seascape Fishing. Offering a guaranteed unparalleled fishing experience – private boat charters, fishing tours, fishing trips and fishing excursions. The number one private fishing boat charter in Barbados. Alternatively you can privately hire Seascape for a intimate Barbados snorkel or relaxed cruise tour. Visit exquisite coral reeds to explore the enchanting underwater world of the warm and crystal clear caribbean sea. Snorkel and swim with a breathtaking array of tropical fish. 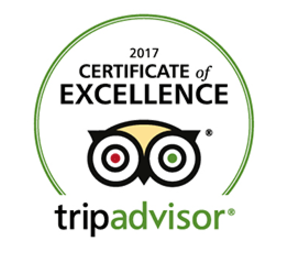 Our excursions are totally customisable, tailored completely around you. Experience an unforgettable adventure – one not to be missed.